The best thing... it's about apound in weight, so it will not slide around. Next best thing... it has a port on top, perfect for flashdrives. It also comes with a nifty little LEF light on a flexible stalk, which is long enough to be attached to a rear port and still light up my keyboard/tablet (I like to do my graphics work in the dark). I don't understand the complaints others have made about the ports... They firmly grip all my USB connectors... So tightly in fact, that they take a little extra effort to shove in, but not so much that it feels like I have the connector backwards. And the one complaint someone had about the length of the USB cable also seems a little odd... The pigtailed connector is a couple feet long, and the box includes a nice long extension. 99% of users should be happy with this arrangement. Not much else to say, except I am quite pleased with it... it's different looking and not ugly, and simply works... I guess if I were to change anything, I would put blue or white LEDs on it, instead of green, but that's a personal preference. Tired of itty bitty lightweight USB hubs that won't stay put? This one will, and has 7 ports - including a handy-dandy top mounted port that allows use of a keychain USB flash drive without having to reach behind or fight the other cables. Front mounted indicator lites and rear mounted connectors make this a very desk friendly device. 1) The wall wart is definately NOT plug strip friendly - this the 21st century, no excuse for this one. GRRRRRR!!! Another minor point is that some flash drives access LED will be turned around the wrong way so you can't see them (when plugged into the top connector) - I don't know if there is any kind of standard for this so I don't know if this is the fault of this particular hub's configuration, or that of the flash drive in question. It's very cute, and I like the way the LEDs light up when something is plugged in and blink when data is going through. However, I have a few complaints. 1) The plugs don't go all the way in because the ports are set parallel to the base, not perpendicular to the surface. One side of the plug is seated all the way, but the other side isn't. 2) Plugged-in items slip out easily. The hub is behind my monitor where nothing moving touches it, yet I occasionally find that my printer is offline because the plug has slipped out of the hub. Why user-centred design really works. The Kensington 7 Port USB 2.0 Dome Hub is a superb piece of user-centred design. For years I've used USB ports that technically did their job, but failed in other areas. Take the most recent that I've been using - made by GE, it suffers from design flaws that are truly infuriating. First, there is not enough space between the USB port sockets, so that USB leads that have fat plugs cannot be plugged in next to each other. Secondly, the unit is so light (despite being a seven-port hub) that it slides around my desk whenever I move one of the leads that are plugged into it. It might work technically as a hub, but as a piece of useful technology it's hopeless. It has quite clearly never actually been tested by a real end-user in a working environment. The Kensington 7 Port USB 2.0 Dome Hub, on the other hand, is superbly designed. Its rounded shape means that the USB lead plugs are adequately separated and all the ports can accommodate a lead with a fat plug. One of the ports is conveniently located right at the top of the dome, perfect positioning for items that are frequently plugged and unplugged, such as pen drives. And, the unit is heavily weighted, and never slides around my desk. And, it looks superb as well. Highly recommended. Does what it says and can do more. While this little linux box does what it claims to do, it is not for a beginer. 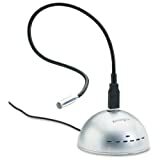 Quite a few seemingly computer beginers have given this product a fairly poor review - I believe that it is often the user and not the product. This product is great for those advanced in nix based systems as with firmware mods, this little box can do just about anything an old 266Mhz computer can (which is quite a lot if you know what you are doing). Don't be fooled by the Linksys advertisements for this device.It will connect to USB 2.0 disks, and will connect to 100mb networks, however do not expect that kind of read or write performance from this grossly over advertised device.From our tests, we found that the write speed was about 10mb/sec and the read speed is around 12mb/sec.If you're using this to backup large amounts of data over the network, expect your backups to take a LONG time...You would be much better off purchasing a powered USB 2.0 hub (at half the price of this thing) and plugging it into a machine on your network and sharing out those disks if you need the extra disk space. This unit does exactly what it says it does. Be careful however-You MUST reformat your hard drive before you can use it with this unit. The real neat thing about this little unit is that it is running an embedded Linux kernel! That means you can turn it into a little web server or a media server--with no PC attached. There are lots of open source projects on the web for this little box. I turned mine into a Twonky server. It now servers MP3s through the house. Would give 5 out or 5 but it is a little slow to start up and shut down. I've had the NSLU2 for about a month. The first thing I did was to upgrade the firmware, which ended up being more painful than I thought... After downloading the latest firmware and starting the upgrade, the NSLU2 got stuck into a state where it said that the upgrade was in progress and I couldn't reboot. Stayed like this overnight. In the morning, I called LinkSys support. I happen not to have any PC's at home, only Macs, and LinkSys phone line doesn'tsupport Macs. Doh. Anyway, they told me to reset and try again. It worked. Other than that the device is working as expected. I plugged a Seagate Barracuda 200G using an external USB enclosure, no issues at all. The documentation is a bit terse w.r.t accounts and groups. I'm a bit annoyed about the "guest" account having access to the main shared partition. It doesn't seem to fit my home usage at all, where I want the main partition to be mountable by all authenticated users belonging to a certain group (e.g. my family), "guest" *not* included. Finally, a tip: if you're going to use "rsync" to backup files from a desktop/laptop onto an SMB partition mounted from the NSUL2, you might want to use the "-modify-window" option of rsync. Without it, I found that rsync would copy files over and over again. Looking for a way to connect your serial devices to a USB port on your PC? 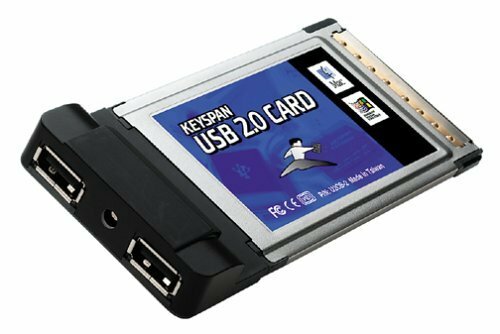 The Keyspan "High Speed" USB Serial Adapter is a simple, inexpensive, and reliable way to make this connection. 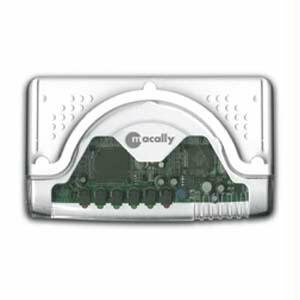 The Adapter is ideal for use with modems, digital cameras, ISDN terminal adapters, graphics tablets, PDAs, bar code scanners, label printers and other serial devices which require an RS-232 connection. This "High Speed" USB Serial Adapter supports data rates up to 230 Kbps---twice the speed of a standard PC serial port. It is 100% USB compliant and features simple "Plug and Play" installation (no IRQs). Ideal for laptops (it weighs just 2 oz. ), the Adapter draws its power from the USB connection so no power adapter is required. Easy to carry -- weighs just 2 ounces! Now you won't have to suffer Windows to use TOPOS with your Garmin. Despite the first reviewers comments, the Keyspan 19HS works just fine with linux. The driver for the 19HS was included in the kernel source a while ago. Standard off-the-shelf kernels (2.4.24 and 2.6.5) work without any patches. In addition to regular usb support, my kernels also load the keyspan and usb-serial modules. After executing "mknod /dev/ttyUSB0 c 188 0", I am happily communicating with Palms and GPSs using the new /dev/ttyUSB0 device. I got the USA-19HS thinking it would be good to support a company that releases it's products with linux drivers.Well, what a disappointment this was, even though there is a picture of Tux on the box along with the Windows and Mac icons this model is not supported in Linux.I emailed Keyspan support and got an auto-repsonder that said they'll get back to me within 72 hours.It's been 4 days and still no response from them.Luckily this thing worked pretty well in OS X so I sold it to a friend of mine and bought myself another USB serial adapter, a keyspan USA-19, which is an older model with good Linux support.Although I replaced this purchase with another one of Keyspan's products I wouldn't support this company in the future and won't recommend them to anyone else. 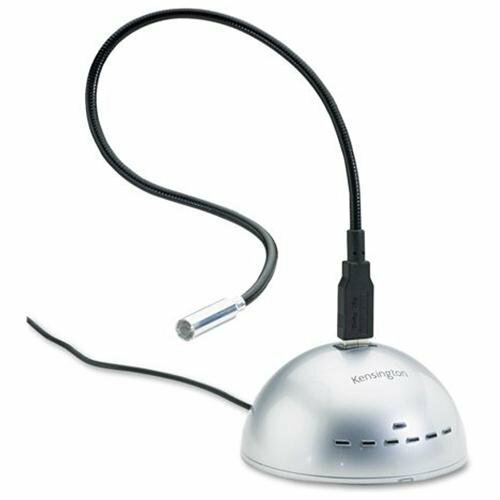 I usually don't write-up reviews, but I am writing this to let those Mac OSX users (inc Panther which is what I am running) know that this adapter does work.I bought this for my Garmin etrex Legend GPS.I use it with my iBook and my Power Mac G4.It was a flawless installation. (1) I installed the Mac OS X drivers (2) told virtual PC to emulate COM 1 using the OS X driver, and (3) Download GPS map data to my GPS.It's that easy! Keyspan has good instructions to set up your serial devices. This product works exactly as advertised.After seating the card, my computer immediately recognized it and installed the required drivers (an installation disk is also supplied if needed). Works extremely well with my iPod.This product was purchased after I initially purchased an inferior Startech PCI card.The card is a great value! Part of my continuing effort toupdate my Dell (Dimension 8200) was to add USB 2 connectivity. Hooked up to the USB 1 ports on the Dell were:photo printer, film scanner, flatbed scanner, PDA, Compact Flash reader, wireless mouse, wireless keyboard, flash drive and external harddrive. Needless to say, there were not enough ports, I had to plug/un-plug devices constantly and since these were USB 2 devices connected via USB 1, they were operating at a reduced speed. Considered buying an external USB hub but it would not have resolved the issue of connecting USB 2 devices to USB 1. I was finally compelled to buy a USB 2 card when I found out that USB 1 does notsupport Apple's IPOD. I bought this particular unit simply because it was the best selling model here in Amazon. I chose the Amazon's re-seller, Office Depot because it listed the lowest price but after shipping and taxes it actually cost me more than if I bought from Amazon directly. So the lesson is: check the shipping cost and if there is a sales tax (if there's a store in you state, you'll be taxed) before clicking the purchase button. In hindsight, I should've just picked this up at a local Office Depot. A few people complained that they received a generic unit instead of an Iogear unit, technically I don't think it would make a difference however, it sure would bother me if a vendor did not deliver what I asked for, after all it is my decision and the vendor should respect that! Office Depot btw did deliver what was specified. Installation was fairly easy. But if you've never opened you PC before I would recommend having someone with a little experience nearby, for moral support if anything. Luckily Dell's are known for well designed cases and allows for easy upgrades. You simply press the lever, open the case and insert the card in the first available slot and that's basically it! (fyi: on the Dell, the original usb 1 comes integrated with the motherboard) If you're running a recent version of Windows XP, the PC should recognize the new card and you're ready to go! In my case, I had to install via the CD since I have an older version of XP and never bothered with upgrades. It was still pretty simple. Also for some unknown reason I had to re-install one of the scanner's software. I was very pleased with the increased speed of my printer and scanners. I no longer have time to make myself a cup of coffee while scanning or printing photos! Since performance was not an issue I left the wireless mouse, wireless keyboard and compact flash reader in the original USB1 slots. Most PC's older than 3 yrs come with USB 1, most peripherals manufactured in the last couple of years are USB 2, some are backwards compatible but at much slower speeds and in the case of Apple's IPOD, it won't work on USB 1 at all. For $20-25, this is an inexpensive, cost-effective computer upgrade. Especially if you've invested a substantial amount in or plan to buy peripheral equipment. Once it's running, you'll love it. Once you get it connected, this is a great little card that will speed you through digital camera and MP3 player uploads. Mine didn't come with instructions so, I assumed correctly that you're supposed to install the software first, restart, and then shutdown. From there you can take apart the computer and install the card. My card however still did not work and I was about ready to Google away for an answer when I decided to e-mail the company instead. Someone from their tech response team quickly replied, "Try placing the card in different PCI slots on the motherboard in case there is an I/O conflict with one of your other devices." Not that I know or care what an I/O is in the first place, but I did as they recommended and voila it works like a charm. I ordered this card from 3B Tech, through Amazon. They mailed me a generic one instead. I have learned a lesson. I will never order from them again. Just a reminder: BEWARE! The latest innovation from USB leader Belkin lets you connect up to seven devices quickly and easily. Our Hi-Speed USB 2.0 7-Port Hub features two, top-loading downstream USB ports. Now you can enjoy fast access for temporary device connections such as USB thumb drives, media readers, and for USB lights, fans, and other accessories. Monitoring your device activity is simpler than ever with LEDs for master power status and all port activity. The stackable, slim-line design saves valuable desk space, and the Hub works seamlessly with all your USB 1.1 and USB 2.0 devices. I would think that USB 2.0 hubs are standard enough that they'd all work fine - but I've had a surprising number of problems with them. This hub seems to work well - it's the first USB 2.0 hub that I've had that (so far) has worked with everything that I've attached to it. I had another Belkin model before, and it was a catastrophe (the model, and my earlier review of it, seem to have been pulled from Amazon).It kept "going to sleep", and needed to be power cycled to wake up.Very strange, very irritating. I've had reasonable luck with a little 4-port "micro" hub with GE's label on it - but it was not compatible with a number of peripherals that I own. Initial product performance was fine, but after about 6 months all hubs failed. Belkin Tech Support says the power adapters are incompatible with my $500 UPS and that they need to be individually coinnected to wall receptacles. To me, that constitutes a product defect and represents wholly unacceptable product performance. Nothing in the promotional literature or specifications says that hubs need to be directly connected to wall receptacles. I am in discussions with Belkin trying to resolve the matter satisfactorily and will report back how they respond. great little unit with innovative, attractive design.the top-loading ports are a neat addition, and i haven't had any of the crash problems described in other reviews here. a couple things to note, though.it runs really hot, so be careful to set it somewhere with decent airflow.also, my pda (palm tungsten t3) encountered errors when attempting to hotsync while plugged into this unit. other than that, no problems.another great belkin product. It would have fit my needs perfectly, especially since I just got an Ipod shuffle, which I could charge and update by plugging in one of the top two ports.But one day my computer, which is running windows XP Pro, wouldn't re-boot until I unplugged it!Then I had to re-install XP Pro, etc.No fun. 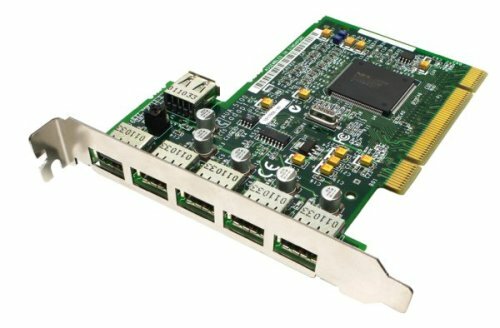 At 400 megabits per second, the FireWire/1394/i.LINK standard is ideal for multi- media input devices such as digital video (DV) camcorders, and high-speed storage devices, scanners, and CD-RW drives. 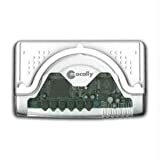 In fact, you can "daisy chain" up to 62 peripherals from the two external FireWire ports on your DuoConnect card. USB 2.0 combines high-speed performance with the plug-and-play simplicity that has made USB peripherals so popular. USB 2.0 products include external hard drives, CD-RWs, DVD-Rs, and scanners can run at up to 480 Mbps. That's 40 times faster than USB 1.1 peripherals! DuoConnect's three external ports provide maximum compatibility and connectivity to the newest USB 2.0 devices as well as USB 1.1 devices. Includes 6-foot FireWire cable - connect your DV camera easily and with maximum throughput with this fully tested 6-pin to 4-pin FireWire cable - a $30 value! Fast but Flawed; Mac users should avoid! 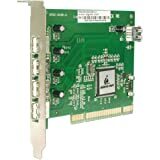 I purchased the Adaptec AUA-3230 DuoConnect card at my local retailer for use with my "Quicksilver" model Power Mac G4 (Dual 1GHz).My built-in ports had gone flakey so I wanted a quality PCI expansion card to replace their functionality.Adaptec used to make some of the fastest SCSI cards around, so I decided to give their product a try.I picked the DuoConnect so I could get some USB 2.0 ports while I was at it. Well, it's very fast -- when copying between internal and external devices, it is faster than Apple's built-in FireWire was!Unfortunately, it has problems -- of the crashing sort.When a firewire device is connected and the Mac is put to sleep, it doesn't make it to Deep Sleep mode (fans keep running), and wakes up again. (This happened with both a bus-powered iPod and a self-powered LaCie d2 drive.The LaCie showed truly strange behavior of spinning down, then up, then down, six times in a row before finally stopping! )The only way out is to turn the Mac off.I contacted Adaptec tech support via their web page. In our unofficial testing of the Firewire 4300 and DuoConnect AUA-3121 and AUA-3020, it seems that the controller itself is compatible with Deep Sleep. Yet as soon as any devices are attached to either the USB or FireWire/1394 ports, the system will not be able to recover from the Deep Sleep function. It appears that this issue is due more to the PCI bus itself rather than to the DuoConnect adapter. When Deep Sleep is initiated, the PCI bus and attached peripherals will be powered down. Yet because the PCI controller is not directly powered from the motherboard, there is no way to send a signal to the attached devices to 'wake' them. This means that a signal can be sent to the attached devices to put them into a power down status, but no signal can be sent to revive them from that state. For that reason the Firewire and DuoConnect card is not fully compliant with Apple's Deep Sleep. What you may want to do at this point is to open up the Energy Saver control panel and set the power settings to "never" to disable Sleep. Yet if this is not an option, then unfortunately there is no workaround for this issue and you may want to return the controller to the place of purchase for a refund. We apologize for the delay in getting this information to you. It did take some time to replicate the issue and search for a possible solution. We hope that you understand. So, in summary: very fast FireWire 400/USB 2.0 card, but useless if your Power Mac ever sleeps.Adaptec's tech support was prompt and didn't send me "form letter" style replies, so props for that!I'll try Adaptec again in the future due to their support team (it's also why I give this card 2 stars instead of just 1), but I'll always beware and make sure there is a good return policy, just in case. After shopping around for a Firwire card I finally found this huge deal!3-Port USB and 2-Port Firewire for only $19.99! DO NOT pay full price for this item.Go to the used and new,there is a new one for $19.99.It takes a little longer to ship out, but this is a great deal. This item takes about 3 secs to install with XP...all you do is put it in, and you're ready.I was up burning dvds within 5 mins. 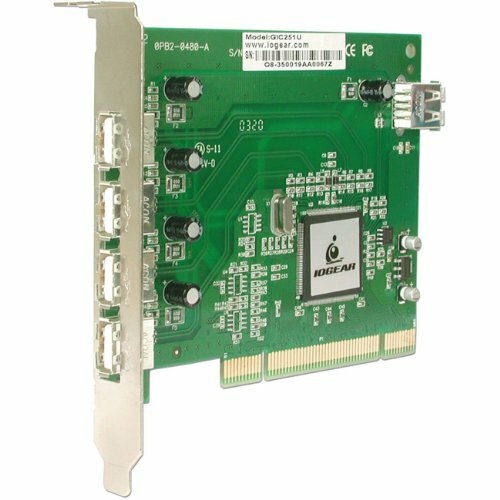 I was a bit nervous about buying this card after reading some of the reviews published here on Amazon, but I did anyway--I wanted to upgrade my computer's USB jacks, and I wanted firewire for the convenience of using that with my iPod. At any rate, my fears went unrealized. Installation under Windows XP went without a hitch: the thing was ready to go five minutes after I opened the box. I can't say I've tried it under different operating systems, but under XP, it's a dream. The only irony like the two previous users mentioned, is that there r some inconsistencies with the software drivers. I realized the system becoming slightly slower in performance (but then again these peripherals were optimized for the new P4 etc.) I use it daily especially with external hard drives and Bluetooth and printers and numerous devices. Easy to set up, keeps cables neat. Excellent throughput even with mix of low-speed and high-speed 2.0 devices plugged to same hub. Only downside is that this port requires AC power to be plugged in (AC adapter included) for it to work, regardless of what you have plugged into the hub. I have gone through a few USB 2.0 hubs and was really bitten by a Belkin model.I finally ran across this one and have stopped my search.This is a truly a wonderful device.I like the layout, making it very easy to plug in devices.I simultaneously plug in to it an illuminated keyboard, a wireless mouse, a microphone, a web camera and a Pocket PC cradle and I still have a couple of ports open to plug in my memory drive when needed.Everything has always worked as expected.And it even looks nice.I am back here buying another one. I had an old USB 1.0 hub that was not activating some of my USB devices when I booted my system. I researched the available USB 2.0 hubs and selected the Adaptec XHub7. I am not sorry I did. It was a snap to set up on my Window XP Home Edition system. all I had to do was plug in the USB devices, provide power to it using the included power supply and every USB device connected with no hithches. I looked around on Amazon for the ideal usb hub. I considered buying the really cheap linksys hub, but I'm sure glad I read the reviews! You can't plug in any devices that actually require power from the usb port because the linksys hub doesn't come with its own power supply. BUT, there are some usb hubs that ONLY work when their power supply is plugged in. I wanted the freedom to use a power supply IF I WANTED TO. The Kensington hub provided every feature I desired in an exceptionally packaged item. This hub is beautiful and oh-so-slim. I don't even think that the power supply is quite as "monstrous" as people have made it out to be...it's more than tolerable. Currently, I'm using all four ports on the hub for my HP all-in-one, my external hard drive, palm pilot cradle, and wireless mouse. It works flawlessly with my windows xp pro operating system. I have no complaints and I'm sure you won't either! Look no further for the perfect hub (unless you want more ports). This tiny 4-port USB 2.0 hub is a must-have for any notebook user. The casing is a silver-metallic color which goes along nicely with my silver laptop. It is *extremely* thin, just a little thicker than the actual USB port itself. 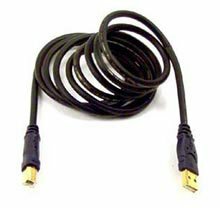 There is a ~2in cable to plug into an existing USB port on your computer (laptop or otherwise). The cable tucks away neatly into the hub's casing when not in use thereby saving more space. The package comes with an additional cable (~2ft) in case you need just a little more reach. I have only used the hub without the included AC adapter, as when i use my laptop i'm normally in a location without access to outlets. It does get warm, but not excessivly (in my opinion). I haven't used any items that could be considered power hungry, such as scanners or external drives. I have used things such as USB flash drives, my PDA, mice, MP3 player without a hitch. My Windows XP system beeps when I plug in the hub, but otherwise is unnoticed. Any laptop user places a premium on items they can carry around that add functionality but dont cost much in terms of size or weight. This hub falls squarely in that description and should be included in every laptop bag. As another reviewer noted, it does have a very large power brick, but other than that, it's been a fine workhorse with absolutely no problems. I present software seminars for a living and I use this little hub at least twice a week.I'm not easy on it and it's still holding up well after almost a year of heavy use.The option to use the power cord is great when you have external USB hard drive enclosures that need the extra juice.Also nice that you don't have to use the power adapter if your devices don't need it.Tossed into a pouch on my backpack, this thing travels with me everywhere. I am using this 2.0 USB hub (with my Thinkpad USB 2.0 Cardbus) for my older thinkpad. I use the USB 2.0 ports successfully with my CD-RW burner and other peripherals. Connect to USB devices via a LAN ! Keyspan announces its revolutionary USB Server that connects USB devices to a Mac or PC via a wired or wireless Ethernet-based LAN. Much like a USB print server, the USB Server enables attached USB devices to be used and shared by client PCs on a LAN. In addition to printers, the USB Server supports other USB devices such as hard drives, scanners, and more. The USB Device Server provides 4 ports for connecting to USB devices at Full Speed USB (12 Mbps). It connects to 10/100 Ethernet networks via an RJ45 connector and supports static IP, DHCP, and Apple's Rendezvous address assignment. Client PCs must be running Windows 2000, Windows XP, or Mac OS X 10.2.8 or higher. share a USB printer or scanner amongst multiple PCs on a LAN. turn a USB hard drive into a simple fi le server. make USB devices available to a laptop via WiFi. 4 USB Full-Speed ports (12 Mbps). Full 500mA power provided to each port. As a multi-computer, multi-OS household (Mac & Windows), it can be difficult to find hardware that works well with both systems.The Keyspan USB server is one that works really well with both. Setup on the Mac was dirt simple (My firewall wasn't turned on.If it had been, it might have taken some reading in the manual to figure things out. )Windows setup wasn't quite as easy, maybe in part because I'm a Mac guy and venture into the world of Windows only when I have to, and then not very happily because the experience is usually not good.Some of the terms used in the manual aren't quite the same as what you'll find on a Windows XP system - the manual used the word "Settings" when what they meant was "Control Panel".I don't know if things changed between the printing of the manual and the introduction of XP SP2, but I had to do a little bit of searching and guessing at what the manual meant when it didn't exactly match what I was seeing on the PC.Other than that, the manual is very thorough and has step-by-step instructions for setting up the Windows XP firewall to work with the USB server.I just turned the firewall off since we're behind a hardware firewall.Once that was done, Windows found the USB server and the software installation happened automatically from the installation CD.Same for setting up the printer - connect to the USB server and Windows finds and configures the printer.I didn't even have to think about printer setup on the Mac.It was completely automatic.In total, I probably spent 15 minutes setting things up - five on the Mac, and ten for the PC. It's sort of a pain having to manually connect in order to print from the Mac.Keyspan promises that a printer auto-connect feature like what already exists for Windows is in development, and I'm reasonably confident that they will come through.But as we're planning to replace the printer with an all-in-one soon, this is pretty much the only way to share something like that between both computers, and it's really a pretty good solution. In that time, I have installed the latest software and updated the firmware.The two really took me about 5 minutes. The update adds a nice feature for single-PC networks.If a device is labeled a single-user device, then you don't need to take control of it every time you want to use it. I also found out that it is possible to boot others off the server (actually everyone). If you go to the Admin tab on the server SW, and edit the server settings (something simple like a password change), it will reboot the hardware (not your PC), which will disconnect all shared devices.This is a rather brute-force approach, but the manual doesn't indicate any other way. Even after an extra 10 minutes of use, I think this device is the best thing since a USB thumb drive (which you can connect to the server as well). This thing is just TOO COOL!!!! Throw away your Print Server.This device is wonderful! I opened the packing box 10 MINUTES AGO, and both of my printers are up and running on every PC. Step 1: Power up the USB server with no USB device hooked up to it, and connect it to the network via RJ45. Step 2: Install the software (if WinXP, use the unsigned drivers).Your OS searches the network at this time and finds the USB Server. Step 3: Hook up your USB devices. If you have a Multi-Function printer, you NEED this device, because even if you find a compatible print server, it will only let you use the print function.A Printer Server turns your Multi-Function printer into a Uni-Function Printer. With this device, it will be just as if the printer were directly connected to your PC.In fact, you are not limited to PCs; you can connect ANY USB device to it (camcorder, scanner, webcam, even a mouse or keyboard). The ONLY advantage that a print server has over this device is that with a server, multiple PCs can control a target device at once (really, that's not quite true, since the requestes are put in a queue). With the USB server, every PC uses a little administration program.When launched, it opens a window that lists all of the devices that are connected to the USB server.A PC on the network that wants to use a device (i.e. print) needs to first take command of that device.You just select the device by name, and hit the connect button.From that point on, it's as if the printer were plugged directly into your PC.Others trying to use the printer would see that you were subscribed to it; they would have to wait until you release the subscription - which you have to do manually. They could really use a virtual queue that keeps checking until the subscription is open, then releases the subscription when the job is completed.The problem is that if the device isn't a printer, how does it know when the job is finished? So, even if you have only one PC on the network, you need to request access to use the printer.On the (sort of) bright side, every time you power up the PC, it will remember who owns what.I think the memory is maintained in the USB Server itself, not the PC.So if a PC takes control of a device, then dies, cycling power on the server releases all devices. This is a little hokey (they claim they MIGHT fix it in a later release) but it's 1000% better than losing printer functions you paid for.They have an 'Admin' panel on the software, but I don't think it currently lets you boot someone off of a device. If you already installed the devices you want to share, then once you connect to the server, every device will show up by name.When you take control of one or more of the devices, Windows goes through the 'new device ready' popup. If you haven't added the device to your PC, then the server will show a default name for the device.Once you take control of it, Windows will detect the PnP device, and start the 'add new hardware' wizard. It's truly as if the USB server didn't exist, and you had a REALLY long USB cable. I have a Canon i950 Photo Printer, and a Brother 9600 MFC. The Brother is particularly painful in that it won't even work with most printer servers.In fact, Windows XP doesn't even have a dedicated driver for it; Brother has all but stopped supporting it. I was highly skeptical, but the MFC's scanner worked right away.As for the Canon, I launched the Status Monitor, and was soon seeing I had to replace an ink cartridge.So, the USB server is bi-directional, too (most Print servers aren't). It took me longer to write this review than it took me to get the server up and running. Purchased this adapter to get connected with two tivo's to my router. Easy plug and play, no software loading required. Would highly recommend as long as you have a series 2 Tivo. I just got this with a Netgear WGE101NA to wirelessly connect a new TiVo to my home netowrk, and it worked without a hitch. My router is im my basement and the master bedroom on the third floor still gets between 65-75% signal strength. Very happy with this product for how I'm using it. I've been a Netgear fan for several years. After trying Belkin and Seagate 802.11b wireless components and signal dropping to poor in the next room, I loved that Netgear components gave me a very good or excellent signal anywhere in the house. So when I got a TIVO I thought I'd use the Negear FA120 together with my Netgear wireless acccess point. Big mistake. Didn't work on the TIVO at all. To test it, I tried it on my computer. Didn't work there either. Called Netgear tech support, got a pleasant young lady, Chinese I think, whose English was marginal. Spent an hour trying to explain the problem, not sure she ever understood what an English speaker would have understood in two minutes. Finally she gave me a totally false and nonsensical solution. She claimed that the only way to get a wireless signal is to have exactly identical components on both ends, which of course is absurd. I later saw on the TIVO website they have a list of compatible adapters, and the Netgear isn't one of them. My fault for not seeing this first. But this doesn't change the fact that the FA120 doesn't work and the tech support was a total waste of time. I'm sending the FA120 back, and my view of Netgear has soured considerably. Works, but you have to install software to make it work. This hub has worked flawlessly since the day I bought it. It adds much needed port capacity/flexibility to my G4 Powerbook. I hade so much clutter in my office from cables and more cables that I was going crazy.This small and great looking combo hub is the best! (comes with magnet set up so you can just hang it on a metallic object on your desk or on metallic message boards). I'm so happy not having multiple hubs taking up more space.It's worked great since the first day and I'm going to buy another for my second computer. If you want a device to make your computer to freeze, and not startup, this is the device you are looking for! Oh and did I mention that some of my devices didn't even work on it? And it is UGLY! This is my first and last product from "Macally"! Don't make the same mistake I did! This single hub has three firewire jacks, four usb 2.0 jacks, and 1 usb 2.0 upload jack.Don't let the earlier review lead you astray -- This will not let you use USB 2.0 devices through a firewire port.The firewire connections are separate from the USB connections and if you want both you need to connect two wires from the hub to your computer, one to the USB interface in your computer and another to the firewire interface. Otherwise it's nice looking and seems to work well enough. This is the only hub I can find that has both USB and Firewire ports, which makes it a cheap sort-of docking station for a laptop. Exceptional Quality at Low Price. This is a good USB cable.It is compatible with both USB 1.0 and 2.0 ports.It is long enough to give great flexibility with arraging whatever it needs to be connected to.The price is extremely good (even though amazon.com changes it every now and then) for this cable.It is way more expensive in stores.And getting a Belkin product for such a low price is excellent.This is totally worth the money, and is a great buy if you need a USB cable. It's cheap, it works.What more could you want from a cable? This is a USB 1.0 AND 2.0 cable. The product description doesn't state this, but this is a USB 2.0 cable meaning you get access to all the extra speed USB 2.0 offers.It's also backward compatible with USB 1.0. The cable is dark grey (it matches the 2004 model Dells nicely), very sturdy, and has a great solid connection when plugged in. The price is low, the quality is not. This is an excellent value. This is my second Belkin cable.The first one I purchased it from Best Buy for 4 times the amount that I paid at Amazon.I bought the Belkin F3U133-06 because it's the best cable avilable in the market. I have been using this cable with my Samsung Laster printer for over 2 years now and couldn't be happier with the no problem performance. Its long enough to be used as a printer cable (which is important) and it works.What more can you ask for from a usb cable? Bring Back Your Legacy Ports! Is your new laptop missing the old ports? Our mini port replicator combines a USB serial adapter, USB parallel printer adapter, and 2-port USB hub into one compact accessory. It draws power from the USB port -- so no power adapter is necessary. Installed the product according to the directions on my Dell Inspiron 5100 running XP Pro. It never recognized the HP OfficeJet Printer. Uninstalled; reinstalled - no luck. Contacted customer support twice. No response. I bought this because I needed a serial & parallel port on my laptop. It did not work for my HP printer (I should have checked with HP first!) makes me wonder what their "works with hundreds of printers" ad-line means. The driver installation for windows is not something a novice user would want to deal with when it goes wrong (I had to uninstall/reinstall, and even then it's got to be in perfect sequence or the device won't show up). And for even the slightest power-drain on the USB bus, this device won't deliver -- in all it became nothing more than a lit up chunk of plastic sitting behind my notebook. I've opted to return it for refund. Belkin brings you Bluetooth technology, the fast and simple way to connect your computing devices to your USB printer without cables and physical connections. The Adapter adds Bluetooth technology to your existing USB printer, allowing it to connect to any device enabled with Bluetooth v1.1 technology. Now you can print from your desktop or laptop computer, or from your PDA, with unparalleled convenience. Simply connect the Bluetooth Wireless USB Printer Adapter to the USB port of your printer and enjoy the freedom and flexibility of Bluetooth wireless technology. People, the issue with all the problems I'm seeing on these cards are coming from two issues.One:You should buy a card with NEC technology - they are much more compatible with Windows.Two:You must update your computer constantly with the Microsoft updates.In my case, I have XP SP2 and had no installation problems and didn't even need to use the enclosed CD ROM. I am rating it 4 stars versus 5 because it appears to be a little flimsy compared to Netgear or IBM branded products.Hey, you get what you pay for. I would recommend it... but be certain you have the updates on your PC before plugging it in. FYI: I'm running WinXP on HP OmniBook XE3, 256RAM, 1066Mhz Pentium III. perfectly on my Dell Inspiron 4100, running Windows XP. 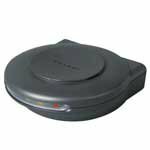 install drivers from the included CD-ROM. Lexar Media 2.0 JumpDrive Pro. SCSI Jaz drive attached to a 16-bit SCSI PCMCIA card. Hub works great and is good value. Firewire/USB 2.0 hub works perfectly with my1999 G4 Sawtooth Mac running Panther. (USB 2.0 card added in addition to a lot of other upgrades.) If you are not esthetically offended by the Compaq logo on the hub, you will be a happy camper. This hub comes with the usb 2.0 and firewire cables included. The inclusion of the cables constitutes a significant savings. Comparable hubs do not include the cables which are pretty expensive to buy. 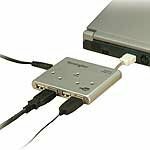 I've got several firewire devices that interact with my powerbook, including a backup drive, an ipod, a camera reader, and often networking between two computers over firewire. I shopped around amazon looking for more firewire ports and a few extra USB slots (mouse, printer, ipod shuffle, etc all take up ports). This compaq stood out from the rest because it says it's a 4 port USB/3 port firewire hub. If you look around, you'll only find 4 port USB/2 port firewire hubs for a similar price. I thought I was getting a deal by getting that one extra port, but it arrived today and I have to say they kind of lied in the product description. The USB section does include four ports, with a fifth small USB port used to connect to your computer. However, the firewire section of the hub has three ports total -- with one port used to connect to your computer. This means that you've really only got two open ports to work with, not three. What is TetraHub 4-Port Hub T4 Technology? TetraHub T4 (Turbo Transaction Translator Technology) provides you with the best of USB 2.0 and 1.1 technology in one solution! What is the difference between the standard USB 2.0 hub and the Belkin TetraHub Hi-Speed USB 2.0 4-Port Hub? The TetraHub provides 480Mbps for all your Hi-Speed USB 2.0 devices such as Hi-Speed USB 2.0 scanners and hard drives. Unlike other USB 2.0 hubs, the TetraHub Hi-Speed USB 2.0 4-Port Hub also supplies a guaranteed 12Mbps to each port so you can connect full-speed USB 1.1 products, like USB speakers and USB video-capture devices that require full bandwidth to operate. Traditional hubs share 12Mbps bandwidth among all the ports. The idea of being able to run a mixed set of USB devices (1 & 2) all without losing any kind of throughput sounded cool. I was sold on the "Tetra" concept & bought one for my girlfriend. In the end, I went through 3 units (the original & 2 replacements), all of them suffering from the same problem: overheating. From a hub? Yeah, I thought it was weird too. The first unit I got ran WAY too hot with the AC adapter plugged in. Not warm, but hot to the touch. Like hand-pulled-away-"ouch! damn that's hot!" hot. I didn't want my girlfriend to lose her USB key drive, printer or iPod by plugging it into the hub. I wrote Belkin & they agreed it shouldn't get warm, let alone that hot, so they sent me a replacement unit (gotta give it to them, their support was on top of it). But then the 2nd unit had the same problem. If nothing was plugged into the hub, but it was on AC power, it was fine. But as soon as you plugged in a single device (or the computer), things started to go south. So I put in another call. They sent another unit. And once again it ran hot. I changed outlets. I mixed & matched adapters (I had a few of them now). I tried various USB devices (1 & 2.0), even tried the hub on a few different machines. Nothing worked. Maybe this thing isn't ready for primetime. Maybe I pissed off the USB Gods in a past life. I dunno, but after 3 strikes, they're out. I wanted to like the hub. Belkin's support is to be commended, but maybe their engineering team needs to spend a few more weeks ironing out the bugs. I noticed the power specs on one of the adapters (and the hub itself) was different than the other 2 (don't remember which replacement hub it was), so maybe Belkin is aware of a power issue & is quietly trying to fix it. So now I'm gonna give my girlfriend one of my older hubs until I can find a decent USB 2 replacement. I do feel burned in more ways than one. Now I have a drawer full of high-tech, useless hubs that I could fry an egg on. It'll be a long while until I buy another Belkin hub again. Possibly anything Belkin. I concur with the previous reviewer's points that the device's weight and ports arrangement make the hub seem cheap and limit it's usage. I'll add that Belkin has misleading advertising for the product and that I recieved rather poor customer service from them. Second, after I plugged the hub into one of my rear USB ports, the other went dead. Since I've decided I didn't want to use this piece of junk, I've been unable to plug any of the other devices directly into either of my PC USB ports anymore. These other devices work when going through the powered hub (or the new drive bay ports), but not otherwise. I have no idea if the technical fault is with the hub or the motherboard, but I've used the USB ports for over 2 years without a hint of trouble until I plugged the TetraHub into them. This hub has several rotten design features. First, it is extremely lightweight, and the weight of its own cord makes it tip on its back. Thus,you have to set something at least as heavy as a coffee mug on top of it. The USB ports in the back are in two pairs. Unfortunately, the ports in each pair are so close together that unless you have a super-flat USB plug, you cannot plug in two USB devices in a set, effectively making your four port hub a two port hub. It works okay, I really don't find a difference in speed from a cheaper port I had, and I don't care about the lights. I usually really like Belkin products, but this one is trying to fake us out with bells and whistles (or in this case, ports and lights). The hub works as advertised and the price was right.Reminder, you don't need the external power supply if you don't have devices such as external disk drives connected.PDA's, printers, scanners, etc. will work just fine without the external power supply. Belkin has another winner in Tetra Hub! Here are a few details you should know about the Tetra Hub. You have to buy the darn thing to figure this out. The Tetra Hub must be connected to a USB 2.0-compliant host in order to function in high-speed mode (480Mbps data rate). If the Hub is connected to a USB 1.1-compliant host, it will operate only in low-speed or full-speed mode (1.5Mbps/12Mbps). Note: The Hub itself will always connect to the host as either a full- or high-speed device, never as a low-speed device. Any idiot that tries to use this with an old USB 1.0 PC port will find it does not work, duh! These are the people who write Amazon reviews denigrating a product and they have not a clue as to how it is supposed to function. I really like the one where someone at Belkin tech support said to take it back and go buy someone else's hub, i.e. "GO AWAY!" The Belkin Tetra Hub provides four downstream USB ports that offer backward-compatible, Plug-and-Play connectivity with all USB devices, including USB 1.1 (or low- and full-speed) devices, as well as with USB 2.0 (or high-speed) devices. This includes such peripherals as scanners, printers, mass-storage devices, and high-resolution cameras. The Hub is self-powered if you use the supplied AC adaptor, which allows the cascading of devices with additional hubs, so that up to 127 USB devices may be connected to a single port. The Hub features neat multicolor LEDs that indicate the operating speed of each connected USB device and the speed of the link to the host computer. More on this feature in a minute. The TetraHub offers several important advantages over traditional USB 2.0 hubs. Most important is its implementation of the new "Quad TT" architecture. Simply stated, when connected to a USB 2.0 host controller, each of the TetraHub's four downstream ports deliver a full 12Mbps of USB bandwidth for low- and full-speed devices while still providing total support for high-speed devices. This is especially important when connecting multiple, bandwidth-intensive, full-speed devices such as USB webcams, speakers, scanners, and external storage devices. The USB 2.0 specification includes three separate modes of data transmission. These are defined as low-speed (1.5Mbps), full-speed (12Mbps), and high-speed (480Mbps). The Belkin TetraHub appears to be the only USB hub on the market today that provides a visual indication of a connected device's speed. This is accomplished using Belkin proprietary speed indication circuitry. Each downstream port on the Hub has a corresponding LED that changes color according to the speed of the connected device. In addition, the upstream port has a corresponding LED that indicates the speed of the computer's USB host controller. IMHO this is an unusual USB hub that is worth every penny Belkin gets. I just wish they had built this technology into the 7-port hub that features two ports on top for my flash drive. I do not work in the computer industry or for Belkin. As I look at my desk, I notice I have a few other products from Belkin that have been very ssatisfactory over the last few years. I hope this Tetra USB HUB continues that experience over time. This card is working fine for me so far. I read a review here that said this card slowed down their system by 50%. I did not experience any slow down. To be sure of this, I ran a benchmarking program before and after installing the card, and the results were the same within the measurement error (determined by running the benchmark a couple of times before installing the card). I installed the card on a WinXP (SP1) machine with an AMD Duron 1.3 GHz CPU and a KM266-8235 motherboard. Perhaps the other reviewer had problems due to an older system? (just a guess). Installation of the card was easy. Just plug it in and WinXP identified it immediately. Some things are not what they seem to be! Installation on a XP PC was super-easy.Just follow the instructions, carefully remove the back (case) of the PC, select the appropiate port, slap it in, replace the cover, turn the PC on - and PRESTO! you're ready to go! XP recognizes the Port Card and it is ready to use. Installs very easily and works like it should! I highly recommend the Adaptec AUA-5100 USB 2.0, 6 port card by Adaptec because of problems with Iogear.I originally purchased the Iogear GCI 250 U, 5 port, USB 2.0 PCI card and had severe problems.When shutting down my PC, the Iogear USB card would send a heavy pulse, most of the time, that would just about snap off the Microsoft Force Feedback 2 joy stick handle.Iogear e-mailed me a new driver.After installing the new driver, the problem still existed. Iogear told me to send the USB card back to Amazon.com for credit -- Iogear had no suggested fixes!The Adaptec AUA-5100 works just like Adaptec says it should.The Adaptec card is well worth the extra money. (Is the Iogear sending damaging pulses into printers? )Plus, Amazon.com promptly credited my account when I returned the Iogear USB card. 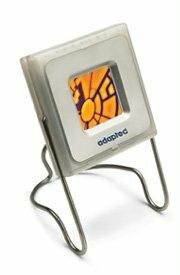 I highly recommend Adaptec and definitely Amazon.com!